John Dering Nettleton was born on 28th June 1917 in South Africa. After school he served as a naval cadet and then for 18 months in the South African Merchant Marine. In 1938, he joined the Royal Air Force and served with three squadrons before joining 44 Sqn to fly Hampdens, taking part in a series of bombing raids and being mentioned in despatches in September 1940. He was promoted to Fg Off in July 1940, Flt Lt in February 1941 and Sqn Ldr in July 1941. It was at the end of 1941 that the superb Lancaster was introduced into service and 44 Sqn was the first to receive them. In 1942 the war was not going well for Britain. Rommel was winning in North Africa, the Japanese were swarming all over the Far East, and U-boats had sent nearly half a million tons of Allied shipping to the bottom. Much more of this and the nation would be starving. also commanded 44 Sqn in 1918.) He immediately set about exploiting the concept of offensive bombing. 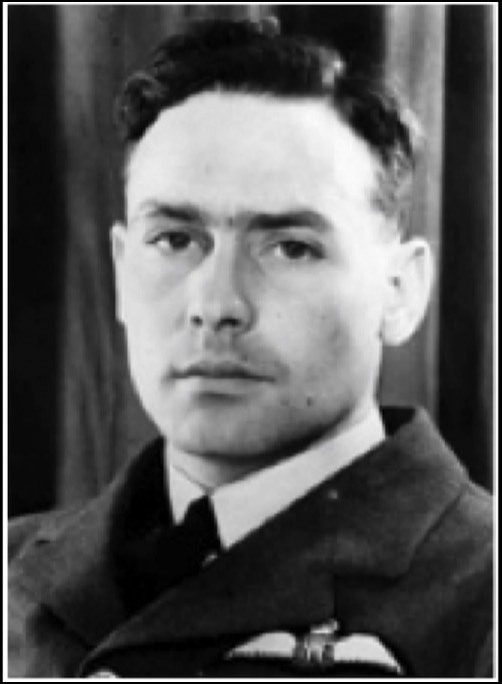 He was approached by the Chief of Naval Staff to find ways in which his bombers could be employed to diminish or hamper the U-boat menace and it was decided that the diesel engine factory at Augsburg would be a suitable target. Twelve aircraft were required for the raid, six from each of 44 and 97 Sqns. The raid was to be at low level and in daylight. The training for the raid involved flying in tight formation at tree top height. The raid was planned for 17th April and the operation order was issued on 8th April which gave them 8 days in which to train. At briefing on 17th April the crews learned the startling news – that they were going to fly a long distance daylight raid against the MAN diesel engine factory at Augsburg, which was quite close to Munich and some 500 miles from the French coast. They were told that there would be two diversionary raids timed to ensure that German fighters along the French coast would be running out of fuel and ammunition by the time the Lancasters arrived on the scene. Take off was at 1500 hours. In response to the diversionary attacks, some 30 German fighters had been scrambled and were returning to base their base at Beaumont le Roger just as the 44 Sqn force was passing by a few kilometres to the north, easy targets for the hungry fighters. It wasn’t long before the formation realised that it wasn’t alone and, after closing up, fought a sustained defence against the attackers. Four Lancasters were shot down in the frenzied encounter, leaving Sqn Ldr Nettleton and Fg Off Garwell to continue on to the target, still being repeatedly attacked. Eventually, the attackers ran out of fuel and returned to base. Nettleton’s crew held a conference and decided that since the aircraft and the bomb load were more or less intact, they should continue with the operation. In this, they chose to ignore the order that if any aircraft of a section should fall, that section should turn back. Long before the remaining two aircraft had crossed the Rhine, German controllers knew that they were on their way and that way might lead to Munich. About 12 miles short of Munich they turned left and headed for Augsburg. The factory was very well defended and both aircraft suffered some hits. After both aircraft successfully dropped their bombs on the factory, Garwell’s aircraft was so damaged by fire that he had to put it down. Three of his crew were lost. Sqn Ldr Nettleton turned for home, with some misgivings about the accuracy of his gyrocompass, preferring to rely on his magnetic compass which was very difficult to read at night and when the aircraft was manoeuvring. At last, they crossed a coastline and radioed for a fix, only to find that they were over the Irish Sea. They were directed to land at Squire’s Gate, an airfield just south of Blackpool. After his return to base he was recommended for an immediate award of the Victoria Cross. John Nettleton and Betty Havelock were married on 17th July 1942 at the church of St Mary Magdalen, close to the White Hart Hotel in Lincoln where the reception was held. At the end of his tour with 44 Sqn he took the briefest of rest tours at a Heavy Conversion Unit before he hurried back to his squadron, which was then based at Dunholme Lodge. To illustrate the sort of commander he was, one night, in between briefing and take off, one pilot decided that he would not fly on the raid. Instead of calling for a reserve pilot, John Nettleton climbed into the cabin and took the crew himself. On 12th July 1943, Turin was the target. Nettleton was not on the original battle order. Indeed, as the squadron Commander, he didn’t have a crew of his own but flew with an assortment of others not in regular crews. It seems that he had some trouble with his ears, serious enough for the specialist to say that he must give up flying for a while. This advice he begged should not be pressed until his second tour of operations was completed. It may be that he took off for Turin, determined to fly as often as he could before the doctors grounded him. He flew with a typical squadron commander’s crew made up of section leaders and spare bods. He was lost on the Turin Raid with no indication from other squadron crews of how his aircraft crashed. It was suspected that his aircraft might have strayed into the range of the guns at Brest and there was a report of a Lancaster with three engines on fire going into the sea in the early hours of 13th July. Later that day, Betty Nettleton was waiting for John to join her for lunch at Coleby Grange, a Canadian base just south of Waddington. He was late so she telephoned Dunholme Lodge to learn that John Slee, the Dunholme Lodge Station Commander, was on his way to see her. She knew well enough what the Group Captain would be saying to her. John’s son was born in February 1944. The Augsburg Raid cost the lives of 24 airmen of 44 Sqn, 14 airmen of 97 Sqn and 7 of the 12 Lancaster bombers. The cost was too high and long-range daylight raids were no longer considered. 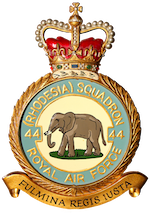 It is an interesting footnote that, of the 43 airmen of 44 Sqn who took part in the raid, 16 were from Commonwealth countries.